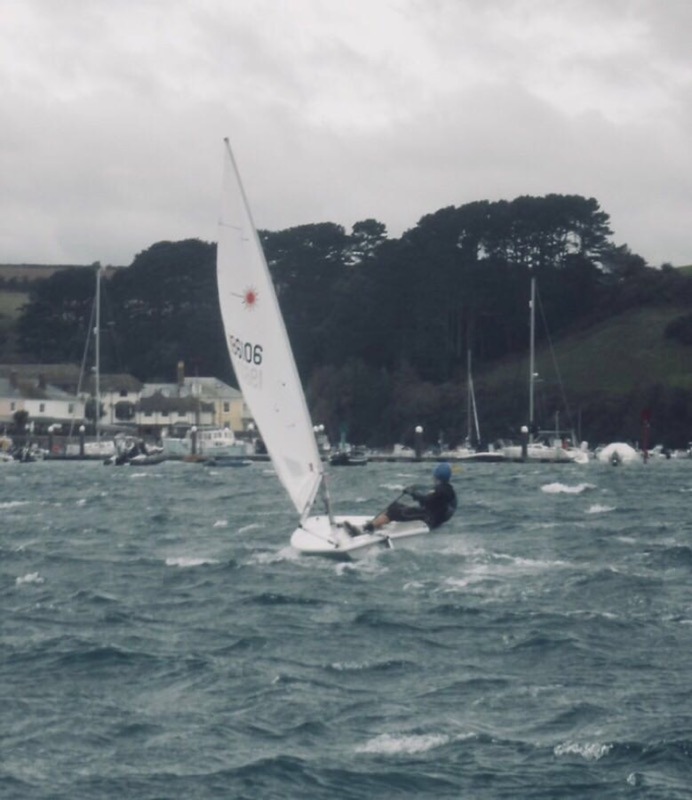 Salcombe Yacht Club : SYC Autumn Series. 6th October. Home / News / SYC Autumn Series. 6th October. SYC Autumn Series. 6th October. Salcombe Yacht Club Autumn series. Race 6. Phantom open meeting aside, which has been/will be, reported elsewhere there were few takers for the club racing at SYC on the 6th October. The medium handicap fleet garnered youngster George Alexander who raced his Laser Radial while septuagenarian Geof Gilson crewed by Chris Spencer-Chapman was the sole representative in the Yawl fleet. Meanwhile six Solos arrived on the start-line. Diffidence arose because of 35 plus knot gusts arriving from the North and heading out to sea with a determined and blackened mien. The blasts’ progress were not impeded by the brisk wind over spring flood tide. Since the average windspeed was around 25 knots, the scene upwind from the start line would have greatly pleased Dante Aligheri. There were many white caps. The sky was grey with forbidding clouds, the threat of rain and even more wind. It was cold. In short, the day was quite unsuitable for sailing. So obviously we went for it. But, we lucky few, who had wrested ourselves away from the shore were in for a treat. 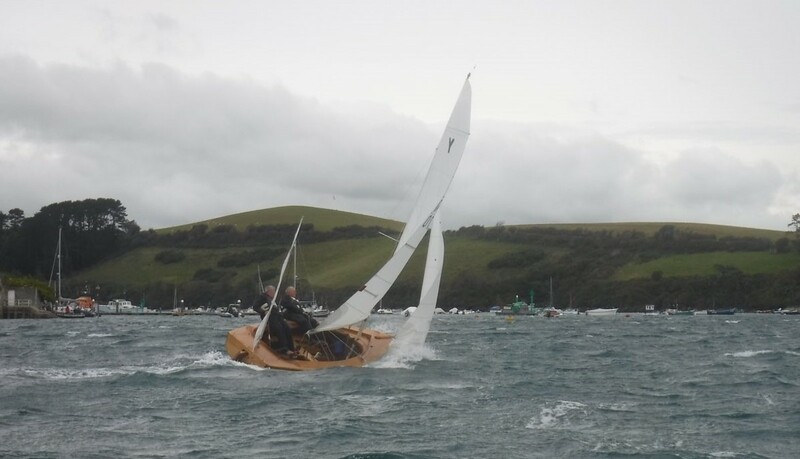 It is not often possible to race in Salcombe when there is this much wind; especially when it prevails against the tide. Simon Dobson, PRO set us a dog-leg beat up to mark 4, South Pool with two laps back to Snapes; then a couple of laps of the main harbour just to spice things up. In practice the beat to South Pool was accomplished in comparative shelter with only the occasional severe gust and forty-degree shift to remind one that the conditions were essentially unpleasant. Billy Jago made the best of this randomness on the first two laps. He was at times threatened by Ed Stephens who was taking a day of work, and Cranford Smith. Greening also was in the mix; as was Adrian Griffin. On the subject of Griffin, there is a lot less of him these days. Lately he has patronised Fat Club in Kingsbridge. The net effect is a marked improvement in his Solo performance. Especially off-wind. It also renders him too light to contemplate a Phantom. Anyhow, laps to South Pool completed, we all set off down-wind for mark 2 which lies off Smalls Beach. Memories of rounding this mark during Merlin Week in a zephyr, receded. This day, it was brisk indeed. Jago had held onto the lead here while Ed Stephens gained mark room on Cranford Smith to round second. As we commenced the beat, in the face of a meteorological onslaught the effectiveness of hiking seemed slight. The usual expedience of applying Cunningham, outhaul, inhaul and kicker until one’s hands bled had limited effect. The flood tide carrying us to windward only served to amplify that perception. Ed fluffed his first tack. His craft succumbed and this gifted third to Greening who was pressing hard. Cranford Smith meantime closed on Jago towards the fuel barge but failed to capitalise, as so often the case, rounding mark 3 about 50 yards off the pace. Principally to avoid gybing, the fleet as whole, opted to transit back to mark 2 down the Portlemouth shore. At this point Jago’s progress courtesy of a monster gust, was largely obscured by the sheets of spray. His Solo generated a twenty-foot wide scar of spume in which we followed. Onlookers of which there were none, might have thought the scene was being played to them on fast forward. For it was by now seriously windy and extremely good sport. Towards mark 2, Jago death-rolled to windward. This was amusing; his spectacles were comically awry on his nose as he emerged onto his centreboard. Since Jago’s mistake occurred at the bottom of the hook to the finish, it was almost impossible for Cranford Smith not to secure first place and so he did. Jago second. Griffin schooled Greening and finished a very creditable third. What great fun. In particular George Alexander slogged around the course and showed what could be done. A great effort from a very talented and more to the point, committed young sailor. Meanwhile Geof and Chris also proved that it is after all possible to sail a Yawl in breeze without breaking the mast.